Apart from running the Hawkesbury Upton Literature Festival, I also take part in lots of events around the UK and abroad. These include giving talks about writing, self-publishing and book marketing, reading my stories before an audience, and selling my books at fairs and festivals. I’ve got a great excuse to return to one of my favourite Scottish cities, Inverness, as part of their festival line-up this autumn. I’ll be giving one talk about self-publishing, and another about writing my cosy mystery series, the Sophie Sayers Village Mysteries. I’m looking forward to being part of this fun book fair in the highly atmospheric setting of the old police cells at Bridewell Street in the middle of Bristol! Click the link for more details via the Facebook event page or visit our event page on the Bristol Festival of Literature website. I’m afraid the tickets have all sold out for this fabulous twice-yearly event, of which I’m co-judge with organiser John Holland. Neither of us will be sharing our own stories, but we’re looking forward to hearing the authors of the ten stories we’ve chosen from this event’s submissions perform before a live audience. If you’d like me to attend your event, please feel free to contact me. 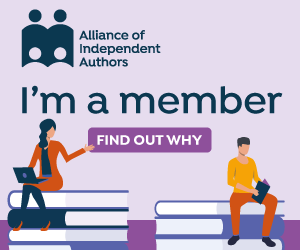 I am a regular speaker on the Alliance of Independent Authors‘ online event, the Indie Author Fringe, which takes place three times a year to tie in with the three biggest book trade fairs in the world – the London Book Fair, Book Expo America and the Frankfurt Book Fair. I’m also in the hotseat for ALLi’s monthly self-publishing Q&A, in league with my author chum, the historical novelist David Penny. I am a regular panelist on the BBC Radio Gloucestershire’s monthly Book Club, part of Dominic Cotter’s lunchtime show and an occasional guest on Suzie Grogan’s 10Radio BookTalk show. I joined other authors giving a brief talk about my writing life and a reading from the fourth Sophie Sayers Village Mystery, Murder by the Book, as part of the Evesham Festival of Words. The fourth annual free festival of which I’m founder and director, featured dozens of authors and artists with a packed one-day programme of events to appeal to all ages and interests. I was delighted to have been invited to launch the first Oakwood Book Festival in Derby, where I also chaired a panel on fiction, sharing my cosy mystery novels, and speaking on behalf of Read for Good about encouraging children to read for pleasure. I met fellow RNA members at this annual reunion. Although I’m a new member of the Association, I’d previously spoken at two of their conferences before and know lots of its members already, including its President Katie Fforde, who kindly provided a cover endorsement of the first novel in my Sophie Sayers cosy mystery series, describing it as “A cracking example of cosy crime”. I was delighted to have been invited back to the Almonry to read at the launch of the Evesham Festival of Words pop-up bookshop. I was in conversation with other local authors Ali Bacon (chair), Anne Corlett and Alice Jolly, talking about our writing lives and answering questions from the audience, at Yate Library. On behalf of the Alliance of Independent Authors, I gave a talk and Q&A for aspiring indie authors keen to reach more readers. I was glad to have been asked to perform my short story “The Emperor’s New Wall” as part of a special evening taking as its theme “Another Country”. Kicking off an exciting new series of spoken word events in the new Cheltenham art gallery, Chapel Arts, I was pleased to have been invited to read my short story “The Impressionists”, taken from my flash fiction collection Quick Change. As well as directing this free one-day festival, I launched my debut novel, Best Murder in Show at this fun event in my home village. We had our usual stall at the Hawkesbury Upton Horticultural Show to spread the word about our main April Festival, and I also launched the second in the Sophie Sayers Village Mysteries series, Trick or Murder? Having read from my own novel, Best Murder in Show, at a previous Novel London event, I was invited to compere the next in this fun reading event at Waterstones, High Street Kensington, where Clare Flynn will read from The Chalky Sea and Joanna Warrington from Holiday. Book your free ticket here. In an idyllic retreat in the heart of rural Wales, I was a guest speaker to a packed house at this friendly and informative event aimed at any authors looking to publish their books. As part of Bristol Literature Festival, Bristol authors A A Abbott, Lucienne Boyce and Michael MacMahon and I will be speaking about the joys of self-publishing, and sharing lots of brilliant advice. In the company of local Bristol authors, I’ll be having fun giving public readings from my short stories and novels on Bristol’s buzzing harbourside. As co-judge for the autumn submissions, as I was in 2017, I’m looking forward to attending the evening at which the ten stories are performed at the Strouds Valley Arts centre by their authors. I’m looking forward to being on the crime panel alongside festival organiser and novelist Lionel Ward, proprietor of Brendon Books, and Sanjida Ray, psychological thriller writer longlisted for the CWA Steel Dagger Award. Highlights of 2014 for me included speaking at the Cambridge Literary Festival, the London Book Fair and Chorleywood Literature Festival’s Indie Author Fair and SilverWood Books‘ Open Days.